The Mayflower in Plymouth Harbor, William Halsall, 1882. I’ve mentioned in previous posts several distant family connections to passengers aboard the Mayflower, the ship famous for one particular crossing of the Atlantic Ocean. It carried along with its crew a group consisting of religious Separatists, who disagreed with the Church of England, and English merchants with their families and servants. The Mayflower sailed from Plymouth, England, on September 6, 1620. In mid-November of that year it came within sight of Cape Cod in present-day Massachusetts. Before venturing ashore, most of the male members of the group signed an agreement known as the Mayflower Compact, by which they would govern themselves in the colony they founded at the spot England’s King James I had named New Plymouth. The first winter was hard on the colonists. Death from disease and hardship claimed more than half of the one hundred and two passengers. In the spring of 1621 the survivors stepped onto Plymouth Rock. Shortly afterward the Mayflower, its crew diminished by disease, bade farewell to the colonists and returned to England. 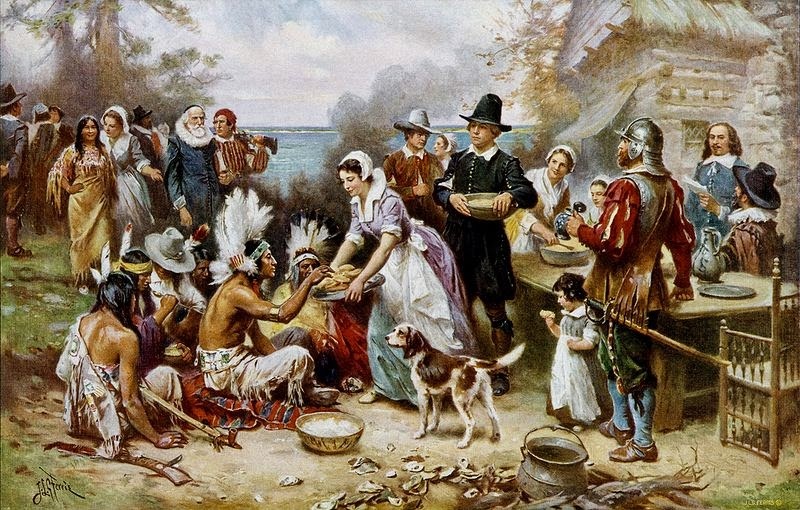 The Plymouth Colony struggled for survival, but with the cooperation of the Wampanoags and other native Americans, they were able to celebrate their first anniversary in the New World. That celebration is still commemorated in the USA on the final Thursday of each November, the holiday known as Thanksgiving. While researching my genealogy I’ve discovered quite a few connections by marriage to Mayflower passengers. Here are those I’ve found. Catharine Rathbun (1818-1894), five-times-great granddaughter of Mayflower passenger George Soule (1597-1680), married Christian Huss (1815-1864), my five-times-great uncle. Hannah Harlow (1720-1792), great-great granddaughter of Samuel and Anne Rider, married Ebenezer Sampson (1716-1808), a direct descendant of no less than four Mayflower passengers: Myles Standish (1584-1656), Priscilla Mullins (1602-1685), John Alden (1598-1687)—all three immortalized by Longfellow’s poem The Courtship of Miles Standish—and Henry Samson (1604-1684). Hannah Rider, great-great granddaughter of Samuel and Anne Rider, married Josiah Bradford (1724-1777), great-grandson of William Bradford (1589-1657), Mayflower passenger and second governor of Plymouth, Massachusetts. William Bradford’s seven-times-great granddaughter, Rena Ann Newcomb (1883-1938), married my great-great uncle Charles Thomas Shanower (1882-1952), not a Rider descendant. Samuel and Anne Rider’s son Samuel Rider (abt 1632-1715), my 11-times-great-uncle, married Sarah Bartlett, granddaughter of Mayflower passenger Richard Warren. Roy Robert Grant and Hilda Lucille Stafford Grant. 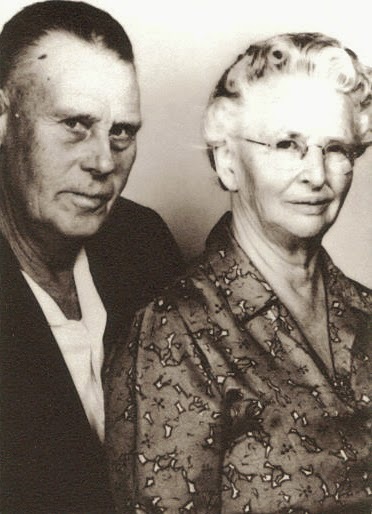 Other descendants of Richard Warren, sisters Hilda Lucille Stafford (1898-1973) and Helene Thelma Stafford (1902-1985), married Roy Robert Grant (1897-1988) and Charles Elwood Grant (1900-1945) respectively, first cousins to each other and second cousins twice removed of mine. These Grants were both seven-times-great grandsons of Samuel and Anne Rider. I discussed the Grants and Staffords in a previous blog post here. 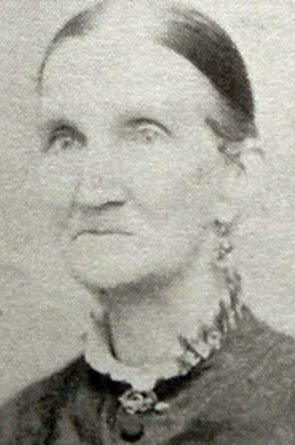 Richard Warren’s five-times-great granddaughter Mary “Polly” Knowles (1806-1879) married Silas Rider (1803-1871), three-times-great grandson of Samuel and Anne Rider. The same Silas Rider, my third cousin six times removed, was also the four-times-great grandson of Mayflower passengers Stephen Hopkins (abt 1580-1644) and Elizabeth Fisher Hopkins (abt 1595-abt 1643). Stephen and Elizabeth Hopkins have other Rider connections by marriage. Their great-great granddaughter Desire Godfrey married Nathaniel Ryder (1705-? ), Samuel and Anne Rider’s great-grandson. Stephen Hopkins’s great-great-great granddaughter Mehitable Snow (1731-1813) married Reuben Ryder (abt 1717-? ), great-great grandson of Samuel and Anne Rider. And Stephen and Elizabeth Hopkins’s great granddaughter Elizabeth Pierce (1737-?) married Gershom Rider, great grandson of Samuel and Anne Rider. The just-mentioned Elizabeth Pierce was also the great-great granddaughter of Mayflower passenger Edward Doty (abt 1599-1655), a servant of Stephen Hopkins. I also have non-Rider connections to Edward Doty. His great-great-great grandson Aaron Doty (1807-1843), married my five-times-great aunt Polly Grandy (abt 1805-1838). Celia Hietanen Woodland as a schoolgirl. Ellis Doty (1861-1895), Edward Doty’s six-times-great grandson, was the first husband of Alta Lucinda Flowers (1870-1929). After Ellis Doty died, Alta and her second husband had a son Homer Floyd Woodland (1898-1959). Homer married two great-great aunts of mine, Ida Justiina Salo (1894-1967) and Celia Hietanen (1902-1925). You can read about Homer and his wives in this previous blog post. Homer Woodland is also reputed to be an eight-times-great grandson, through his mother’s mother, Maza Rowley Flowers (1835-1910), of Mayflower passengers Edward Fuller (1575-1621) and his wife, whose name is unknown. There may well be other marriages that I’m not aware of between my blood relatives and Mayflower descendants. Over the years, I’ve wanted to find more than simple marriage connections to Mayflower passengers. I’ve been hoping to stumble across a direct Mayflower ancestor. I may have done that. The Mayflower passengers I mentioned just above—Edward Fuller and his wife—seem likely to be my eleven-times-great grandparents. I'm not absolutely certain of that because there's a weak link the in the chain of descent. 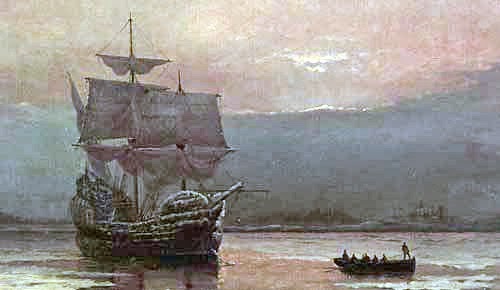 The first few generations descending from Edward Fuller and his wife have been established by decades of research by others into Mayflower passenger genealogy. Edward Fuller and his wife were part of the Separatists who moved from England to Leiden in the Netherlands in order to practice their form of Christianity. After several years in Leiden, members of the Separatist community formed the plan to move to the New World where they wouldn’t have to worry about their children being absorbed into the Dutch community of the Netherlands. Edward Fuller with his wife and younger son Samuel (abt 1608-1683) decided to go along. Edward Fuller’s brother, also named Samuel Fuller (abt 1580-1633), joined them on the Mayflower as physician. Brothers Edward and Samuel Fuller both signed the Mayflower Compact. Edward Fuller’s elder son Matthew, stayed behind, probably in England, and arrived with his wife and family in the Plymouth Colony on a later ship. Both Edward Fuller and his wife were among the many Mayflower passengers who died during the first winter in Massachusetts. Their son, Samuel Fuller, survived and lived with his uncle Samuel’s family in the Plymouth Colony. Samuel, son of Edward Fuller, married Jane Lathrop (bef 1614-bef 1683). One of their children was John Fuller (abt 1655-1726), who married Mehitabel Rowley (1660/61-abt 1732), and lived in East Haddam, Middlesex County, Connecticut. Mehitabel was a granddaughter of Matthew Fuller, the elder son of Mayflower passengers Edward Fuller and his wife, and so a first cousin once removed to her husband John Fuller. Church records from East Haddam provide information that one of John and Mehitabel Fuller’s children was Shubael Fuller (abt 1684-1748), who married Hannah Crocker. One of Shubael and Hannah Fuller’s children was Shubael Fuller, Junior, (1721-abt 1800), who married as his second wife Sarah Chapman. Up to this point the line of descent from Edward Fuller and his wife is firm, proven primarily by wills and church records. Beyond this, the evidence for further descent grows scanty. The book Genealogy of Some Descendants of Edward Fuller of the Mayflower by William Hyslop Fuller, published in 1908 (hereafter referred to as Descendants of Edward Fuller), claims that Shubael Fuller, Jr., had a son Jethro Fuller (1770-1821). This Jethro Fuller was Shubael, Jr.’s second son named Jethro. The first Jethro is attested in church records from East Haddam, Connecticut. Descendants of Edward Fuller claims the first Jethro died young. The idea of naming a child the same name as a previously deceased sibling might seem dubious. But this naming custom was common in the eighteenth and nineteenth centuries. I’ve run across so many instances of it that I don’t find it unusual anymore. So there’s no reason there couldn’t have been a second Jethro Fuller, son of Shubael Fuller, Jr.
I’ve found apparent geographical links between Jethro and other Fullers who seem to be his family. The 1810 US Federal Census records a Jethro Fuller and household of eight others living in Lenox, Berkshire County, Massachusetts. Descendants of Edward Fuller says that Jethro died in Lenox, Massachusetts. 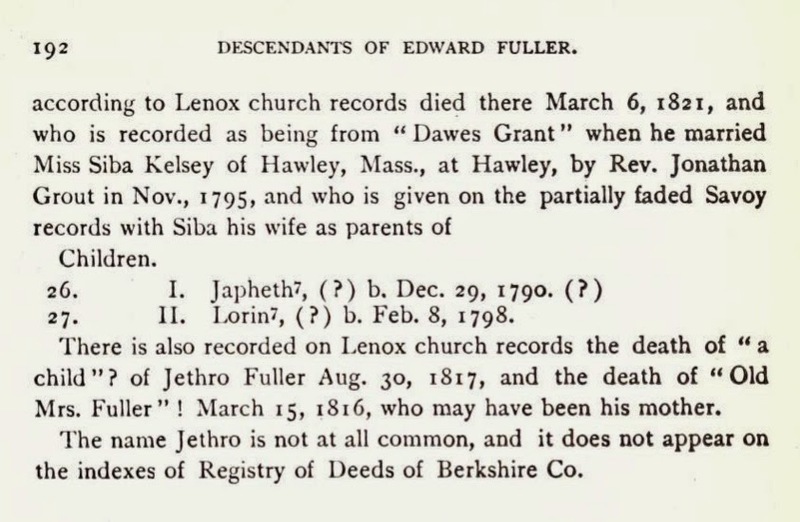 Lenox was also the dwelling place of Jonathan Fuller, clearly a son of Shubael Fuller, Jr., as attested in East Haddam, Connecticut, church records. Both Jethro and Jonathan were also from Dawes Grant, a tract of land in Hawley, Massachusetts, where Jethro married Siba Kelsey in 1795. Other sons of Shubael Fuller, Jr., linked by Descendants of Edward Fuller to Lenox and Savoy, Massachusetts, were Jedediah and another Shubael. Eliezer Fuller had property exchanges in Massachusetts with Jonathan Fuller and Shubael Fuller. The idea that these Fullers were all brothers of Jethro, as Descendants of Edward Fuller claims, is well within the realm of possibility. Town records of Savoy, Massachusetts, give two sons of Jethro and Siba Fuller: Japheth, born December 29, 1790, and Lorin, born February 8, 1798. That’s where the more-or-less documented chain of descent ends for this line descended from Mayflower passengers Edward Fuller and his wife. Jethro Fuller and Siba Kelsey Fuller's children listed in Genealogy of Some Descendants of Edward Fuller of the Mayflower by William Hyslop Fuller, 1908. 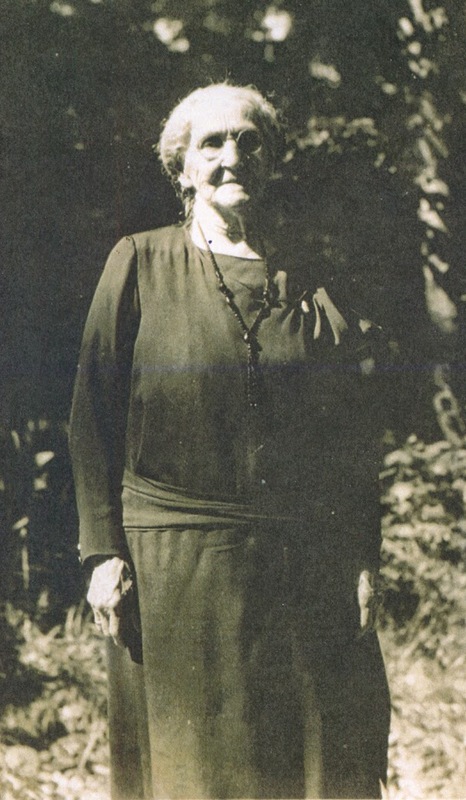 Elma Louisa Conkey Grandy, June 1, 1930. But can I connect that line to my known ancestors? Let's see. My great-great-great grandmother was Elma Louisa Conkey Grandy (1835-1934), grandmother of Adella Cecil “Dell” Grandy McElroy Evans Hundhammer (1888-1974)—who I wrote about in this blog post—and mother of Millard Curtis Grandy (1867-1941). Elma’s maternal grandfather was named Loring Fuller (1798-1863). Census records, other written sources, gravestones, and the fact they and many of their immediate family members lived in Chatham, Medina County, Ohio, support this. What are the chances that Elma’s grandfather Loring Fuller and the Lorin Fuller reported to be the four-times-great grandson of Mayflower passengers Edward Fuller and his wife are one and the same? This is the weak link I mentioned above. Let’s examine the evidence for these two Fullers. One is spelled with a “g”—Loring. The other isn’t—Lorin. Yes, they’re different, but only slightly. In a time when many Americans were illiterate and the spellings of words hadn’t been standardized, I’m not sure that the difference in these Fuller first names is significant. In the 1850 and 1860 US Federal Censuses, my certain relative Loring Fuller, who lived in Chatham, Medina County, Ohio, was recorded to have been born in Massachusetts. An entry for Loring’s son-in-law George Melton in the 1889 book Biographical Souvenir of the State of Texas lists Loring as being from Massachusetts. That information is in general agreement with information about Lorin Fuller, the son of Jethro Fuller, who was recorded to have been born in Savoy, Massachusetts. 1860 US Federal Census listing for Loring Fuller and family in Chatham, Medina County, Ohio. Remember you can click on any image to see it larger. The gravestone of Elma’s grandfather Loring Fuller stands in the Chatham Township Cemetery in Chatham, Medina County, Ohio. Here’s a photo of that gravestone. It gives Loring's death date as March 17, 1863, and his age at death as sixty-five years, one month, and eight days. That would make Loring Fuller’s birth date February 9, 1798. That date doesn’t match the birth date of Lorin Fuller, son of Jethro Fuller, which is February 8, 1798. But notice that the difference between them is a single day. The 1840 US Federal Census lists a Loren Fuller living in Sullivan, Lorain County, Ohio. “Loren” is another spelling, but is this individual the same as either Loring or Lorin? There’s no sure means to tell. This Loren is between forty and fifty years of age, and any Loring born in 1798 would be about forty-two. So that matches. There’s a white female between thirty and forty years of age. This agrees with Loring Fuller’s wife who was born in 1801 and would be about thirty-nine in this 1840 census. Her name is variously spelled Orpha, Orphila, and Orphilia. Her maiden name is unknown. However, the age ranges listed for the other people in this 1840 census mostly match the records I have of Loring and Orphila Fuller’s children, but not exactly. There are also discrepancies in the number of them and their genders. 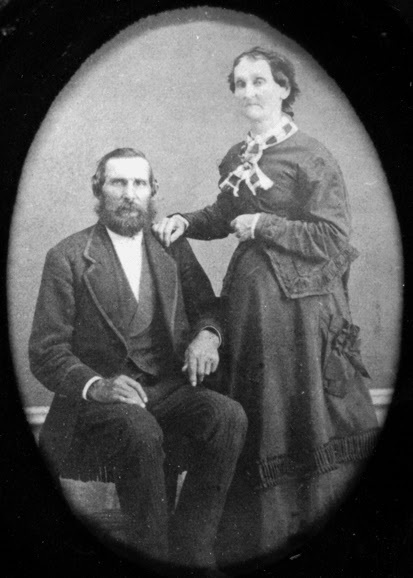 Jonas Chilson Conkey and Mary Loretta Fuller Conkey. The 1830 US Federal Census lists a Loring Fuller living in Nichols, Tioga County, New York. Here the children exactly match the number, genders, and age ranges in my records for Loring and Orphila Fuller’s children. Also, Loring and Orphila’s first three children, including my four-times great grandmother Mary Loretta Fuller Conkey (1824-1877), were all born in the state of New York, where this Loring Fuller and his household were living. But this 1830 census lists both the adult male and adult female in the household as being between forty and fifty years of age. This doesn’t match with my relative Loring, who’d have been about thirty-two, nor with his wife Orphila, who’d have been about twenty-nine. These two censuses, 1830 and 1840, might be the right Loring if the census-taker recorded inaccuracies. The censuses might record the necessary path of Loring and his family from Massachusetts through New York to Ohio. But they might not. There was another Loring Fuller, a son of Zephaniah Fuller, who was born in Kingston, Massachusetts, in 1789. He was a descendant of Samuel Fuller, the Mayflower physician brother of Edward Fuller, and a distant cousin to Lorin Fuller, son of Jethro. For a while I suspected that my five-times-great grandfather Loring Fuller might be the same as this Loring Fuller of Kingston. But I’ve come to discount that possibility because the birth dates of the two don’t match at all. There are still sites on the internet that conflate them, however. A Loring Fuller was born 1800 in New York, as recorded in American Genealogical-Biographical Index, volume 59, page 349; and a Loren Fuller was born 1800 in New York, as recorded in American Genealogical-Biographical Index, volume 59, page 349. I suspect these two are the same person. He's possibly identical with Lorin Fuller, son of Jethro Fuller, although there’s a discrepancy between this Loring/Loren Fuller’s New York place of birth and Lorin Fuller’s evident birth in Massachusetts. And he's also possibly identical with Loring Fuller, grandfather of Elma, except for the same birth place discrepancy. The birth year is slightly off, too. A Loring Fuller and wife Betsey had son Philo S. Fuller in 1827. Philo Fuller died in Springfield, Massachusetts, in 1876, so it’s quite possible that his father Loring was the son of Jethro Fuller born in 1798 in Massachusetts. A Loring Fuller and wife Laura had daughter Caroline A., born in Berkshire, Massachusetts, about 1827. It’s possible that this Loring was the son of Jethro Fuller, especially since Savoy, Massachusetts, where Jethro’s son Lorin was born is in Berkshire County, the same county where this daughter Caroline died. I have no record that my five-times-great grandfather Loring Fuller had any child named either Philo or Caroline. There are no records that he was married to either a Betsey or a Laura. So if either of these two previous Lorings is identical with Lorin, son of Jethro, then the chain of descent doesn't connect. But I've found nothing to suggest that either of these other Lorings was, in fact, a son of Jethro Fuller. So this evidence is inconclusive. There are many other Loring/Lorin/Loren Fullers recorded at various times and places in North America, but they all have birth years so distant from 1798 that I have discounted them from consideration. So after sifting the available evidence, what is the chance that my five-times-great grandfather was the son of Jethro Fuller? They had a similar name. They had the same general birthplace. They had a similar birth date. In the end, it's that birth date, with a discrepancy of a single day, that I believe means they were almost certain to have been the same person. A cousin of mine who has done years of research on this family line doesn’t accept that our ancestor Loring Fuller is the same as Lorin, son of Jethro Fuller, because there is no proof. I agree there isn’t proof. But the evidence weighs so heavily in favor of them being the same person that I accept the idea as true. Of course, there’s a bit of wishful thinking in my acceptance—because if it’s true, then I’m a direct descendant of Mayflower passengers Edward Fuller, his unnamed wife, and their son Samuel. That means I’m also related by blood to Edward’s brother Samuel Fuller, the Mayflower physician. That opens up a whole new slew of marriage connections to other Mayflower passengers, including Francis Eaton and his wife Sarah, their son Samuel Eaton, John Billington (the first murderer in the Plymouth Colony) and his wife Elinor, their son Francis Billington, and John Howland (who fell off the Mayflower in a storm and was rescued). It also means I’m related by blood on my father’s side to Homer Floyd Woodland, who married two of my great aunts on my mother’s side. So I conclude that I'm related by blood to four Mayflower passengers and have connections by marriage to fifteen more. I’ll take it. Idealized painting of the first Thanksgiving by Jean Leon Gerome Ferris. Jonas & Mary were my great-great-great-great grandparents. Thank you for posting your primary sources. I've been inundated with family trees that cite no sources and are often full of mistakes that are fairly easy to prove. I appreciate you sharing your work here!